The Indigenous People of Biafra, IPOB, has rejected the withdrawal of the quit notice issued to the Igbos by the Coalition of Northern Groups. The coalition had ordered the Igbos to leave the north on or before October 1, 2017, but a suspension of the notice was announced on Thursday by the group’s spokesperson Abdulazeez Suleiman, at a press briefing at the Transcorp Hilton hotel in Abuja. 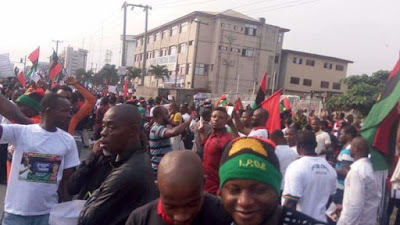 But a statement issued by the IPOB’s spokesperson, Emma Powerful, on Friday, said the withdrawal was inconsequential as far as their aspirations were concerned. “It is inconsequential to IPOB whether the ‘quit notice’ was rescinded or not because it will in no way impact the pace and direction of our effort to restore Biafra. If they had any honour, they will ‘stick to it,’’ he said. ”Threats don’t have any effect on us, so our advice to the Arewa North is to please stick to the October 1 deadline or else they have no honour. We urge all Southerners in the core North to return home before October 1 as history will most definitely repeat itself,” he added. He said Southerners (living in the North) must be vigilant despite the assurances given by the coalition. IPOB also had verbal barbs for President Muhammadu Buhari. ”If President Muhammadu Buhari is at all serious about clamping down on hate speech, he should arrest those behind the ‘quit notice’ along with their sponsors. » N’Delta Militants Issue Quit Notice To Northerners AGAIN!